Johan Tserclaes, Count of Tilly (1559-1632), more popularly known as “General Tilly”, is a frequent subject on Diesinger beer steins. General Tilly was Commander of the Catholic Holy League during the 30 Year’s War against the Protestants, winning several important victories. However fate turned against him in 1632 when he was wounded during a battle with Swedish forces along the Lech River in Germany and died soon afterward in Ingolstadt. See also Nos. 61 and 68. 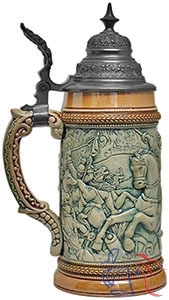 Same model number applied to a stein depicting a Stag and Hunting Dog.